Meet my Icelandic nemesis, the Kjalvegur route that winds its way through the central Highland plateau. Shortly after taking this image the razor-sharp lava at the side of the road eviscerated a tyre when I pulled in to let a speeding 4WD past. When I managed to fit the spare – a job made more difficult due to the freezing rain, biting wind and the hire company not including all the tools in the toolkit – I soon discovered that it wobbled in a worrying fashion. It was only when I took the car to a garage that I found out that the spare wheel had a twist in it and I was lucky to have made it as far as I had. So, round one goes to Kjalvegur but I will be returning for a rematch in 2016! Bruarfoss became, quite frankly, a bit of an obsession. In the months leading up to the return trip to Iceland this year I knew that I really wanted to visit Bruarfoss. It is one of those oddities in travel – a hidden gem off the tourist path that, despite its beauty, no one seemed to talk about. As I researched it I began to understand why it is, at least so far, off most visitors radar. 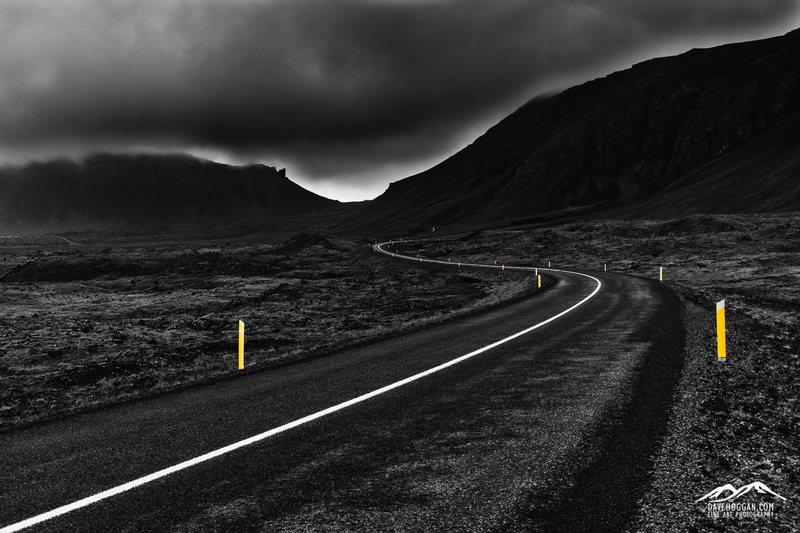 First, despite being located near one of the busiest tourist roads in Iceland, route 37 that travels right past Geysir, it is located down a potholed, mostly single-lane dirt track that prevents coaches from getting near. 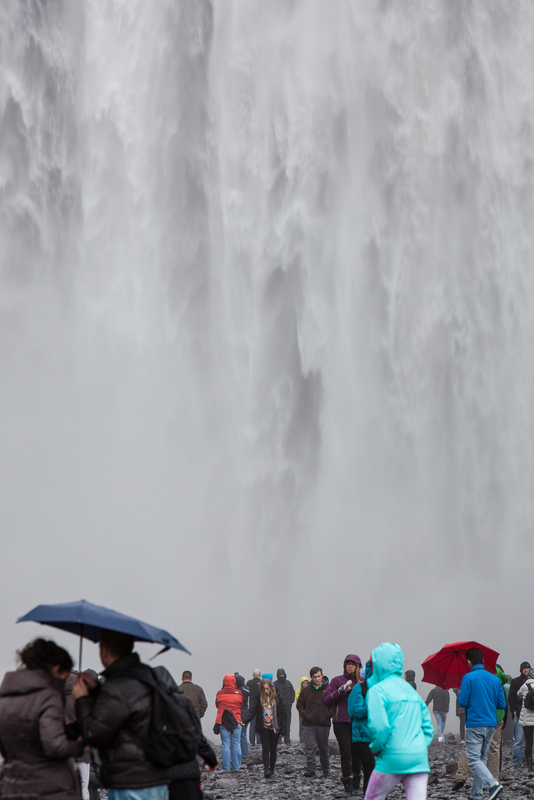 As most visitors to Iceland tend to be those that base themselves in Reykjavik and take day trips to the various sights, this pretty much eliminates most visitors from seeing Bruarfoss. For those that do venture out and hire a vehicle (and I feel confident in suggesting a normal 2WD car driven carefully would be fine) finding it is the biggest challenge. Looking at Google Maps there are three possible paths that each take the intrepid driver on a windy path through what appears to be a summer home area, which apparently it is. Turn to the Internet and matters become more confusing as some people suggest one route, with others countering that the route is not possible as the track has a barrier across it and that you need to go another way instead – a suggestion that yet more people disagree with. It doesn’t help that the Google Maps road overlay has inaccuracies either. I spent untold hours over a couple of months trying to find instructions that any two people agreed upon. I failed. For me, with two days set aside for the Bruarfoss area, it was frustrating – I didn’t want to spend a half-day just trying to find the place – but for those don’t have the luxury of such time, I can see them either being put off altogether or simply running out of time trying to find it. Which is a real shame as it is, quite simply beautiful. 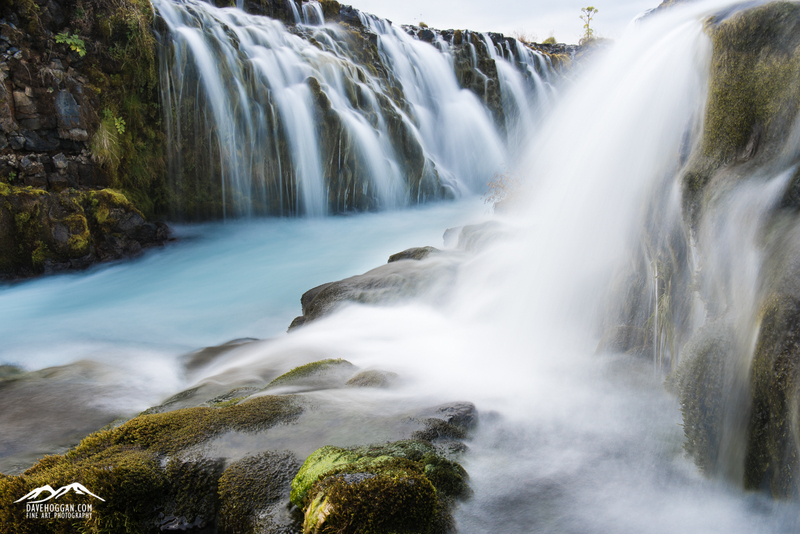 As impressive as the waterfalls in Iceland generally are, you can’t help but getting a little blasé by the time you’ve marvelled at the first thirty or forty. In fact, barring a particularly deep-rooted passion for waterfalls, by the end of a couple of weeks you’ll find yourself largely not noticing them. And so it would be with the rather unassuming Kirkjufellfoss, a modest waterfall just west of Grundarfjörður on the Snæfellsnes peninsula. 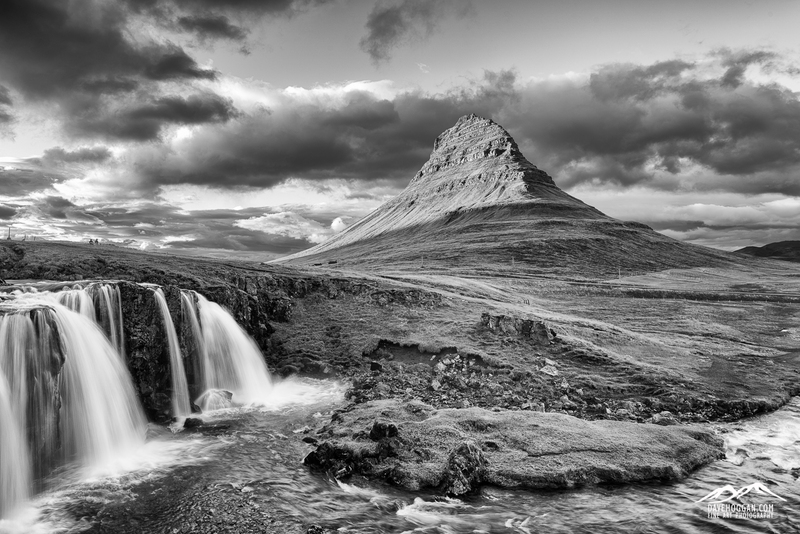 Bluntly, after you’ve visited some of the other waterfalls on the usual itinerary, it wouldn’t really warrant a stop were it not for the striking presence of the nearby Kirkjufell mountain. Despite nature conveniently placing the two next to each other it is a surprisingly difficult combination to photograph simply as (1) it has been photographed by thousands of photographers already and (2) there is always a hoard of photographers lined up trying to capture an interesting angle not already captured by one of the aforementioned thousands of photographers. This shot was taken close to sunset on one of the few days where the cloud cover on the peninsula broke enough to allow shadows to dance across the land and illuminate Kirkjufell. Sometimes you look up from what you’re doing (driving in my case) and see a scene that so completely reminds you of something that you can’t see anything else. 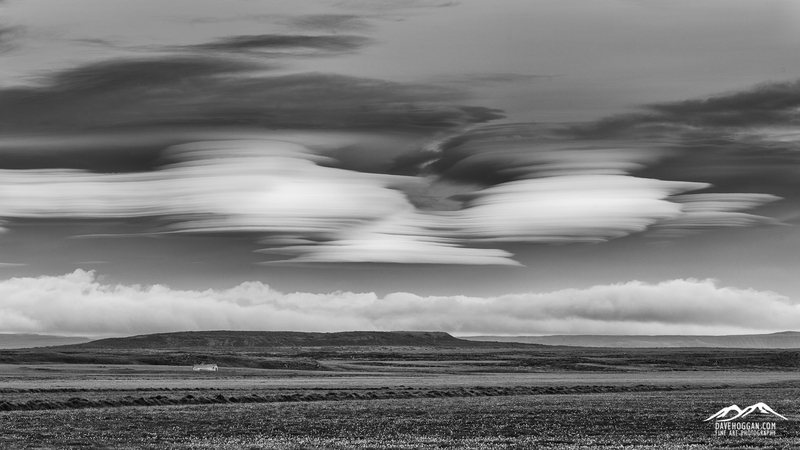 So it was when driving along route 37 in Iceland looking for a building with a shiny metal roof for a composition I had in my head. The moment I saw I it knew what I saw and now can’t see anything else – probably a testament to the state of my mind more than anything. In fact, if Rorschach hadn’t opted for using ink blots I’m pretty sure he’d have used clouds. Route 574 on the Snæfellsnes peninsula in the west of Iceland. It’s a sparsely populated and barren area dominated by the central spine of high peaks ending in Snæfellsjökull volcano made famous by the Jules Verne novel Journey to the Centre of the Earth. Clouds gather and can linger for days. 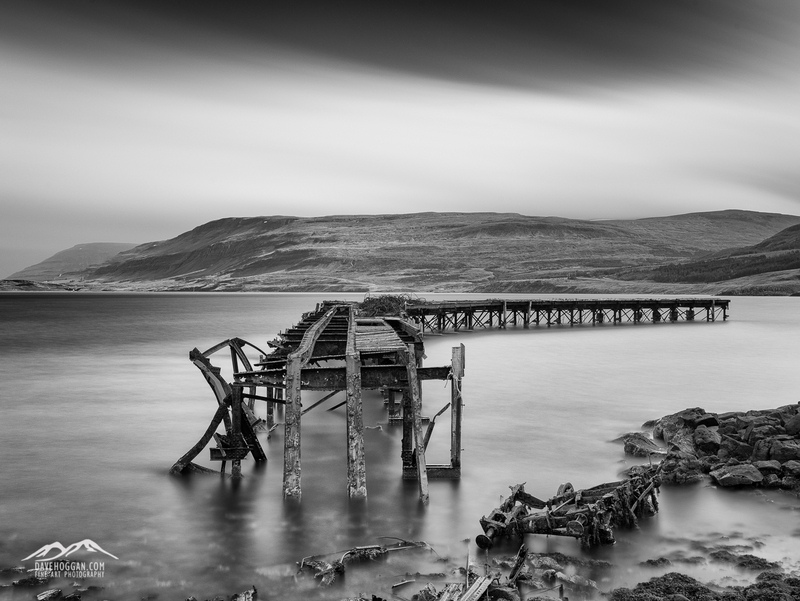 Not always great conditions for photography but it creates a great mood. I’ve been after a decent “road” shot for a while and drove along this stretch a few times. 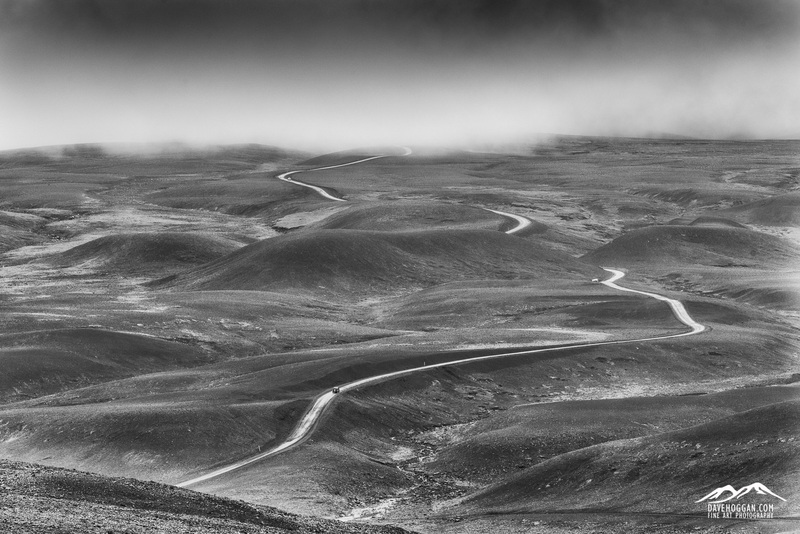 The barren landscape and dark clouds dictated a black and white conversion, but I didn’t want to lose the yellow roadside markers so I added them back in after the conversion. I don’t like a lot of post processing (laziness can be a gift!) but in this case the image is stronger for it. Many tourists worry about driving in Iceland, but other than around the capital Reykjavik, this is as busy as the roads get. With the trip to Iceland being tomorrow and packing essentially complete I’m now at the point where I’m actually beginning to get excited. In fact there are only a few items left to deal with, including buying a few of those “meals in a bag” for the middle of the trip when I’m up in the Icelandic highlands and nowhere near a supermarket. That’s the double-edged nature of Iceland: It’s a truly breath-taking country but it favours the prepared. Now, I do consider myself a reasonably prepared traveller, including the steps I take to stay out of trouble. But a recent post by a regular contributor over on the Trip Advisor Iceland forum did stop me in my tracks. In it she suggested that the profile for those travellers to Iceland that end up never leaving (alive) is male, a solo traveller, hiking and often with some experience. I fit 100% into that profile and whatever the source of this statistic I found myself double-checking my preparations for a “worst-case scenario”. Risk analysts with tell you that there are three ways to deal with risk: Accept it and carry on (assume the risk), take steps to reduce the risk (mitigate the risk) or get someone else to handle the risk (transfer the risk). Depending upon the situation each option can be a valid approach, but in the case of my time in Iceland’s highland interior as the predictably unpredictable weather continues to worsen, option one would be plain, flat-out, stupid and option three (in this case meaning going on an organised trip) would be too expensive – if possible at all – and so inflexible as to render the reason for being there not worthwhile. So it was time to take the middle ground. It is worth pointing out that there are usually three potential sources of danger in a given environment: From other humans, from animals and from nature itself. In Iceland you can disregard the first two completely. If anything is going to cause you problems, it will be the weather. 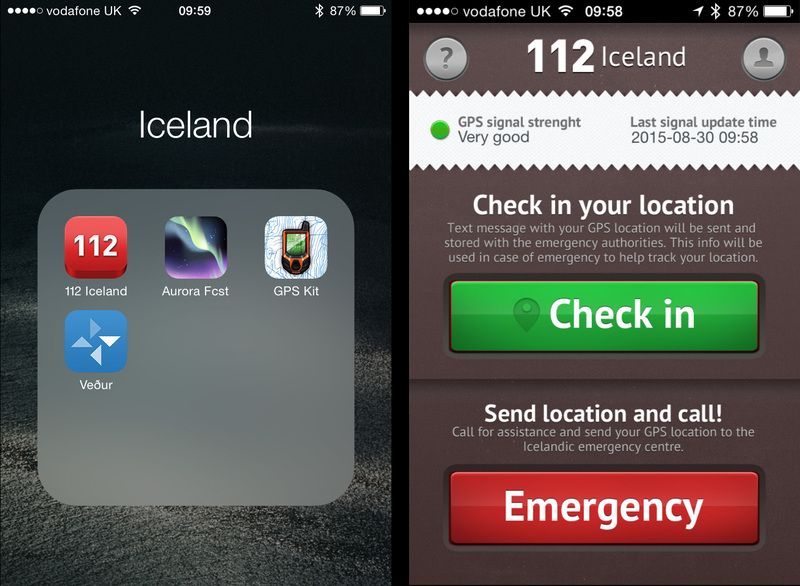 Everybody loves 4G but despite being “so last century” GSM is your new best friend in Iceland. So, should the worst happen I’m more than likely going to have access to the outside world, but who am I going to call? Perhaps the obvious would be friends or family back home. If I had no other alternative then, well, I have no other alternative but I’m not going to be calling for a chat – I’m going to be having an emergency. If you’ve ever tried it trying to organise a rescue for someone from another country it is very difficult and as time is the enemy here, I really I don’t want to be in that position. So I’m making sure that I have the phone numbers for my accommodation in Iceland and confirming my arrival with each of them on the morning of arrival. An example of why making sure that the accommodation knows you’re definitely arriving is useful happened to me back in 2010. We were taking a 4WD from the village of San Pedro de Atacama in northern Chile to the town of Uyuni in southern Bolivia. It’s a route taking three days and involves travelling through the northern Andes at an altitude of 4,500 metres. It’s a barren, unending wilderness where the temperature drops to -15°C or below once the sun goes down. 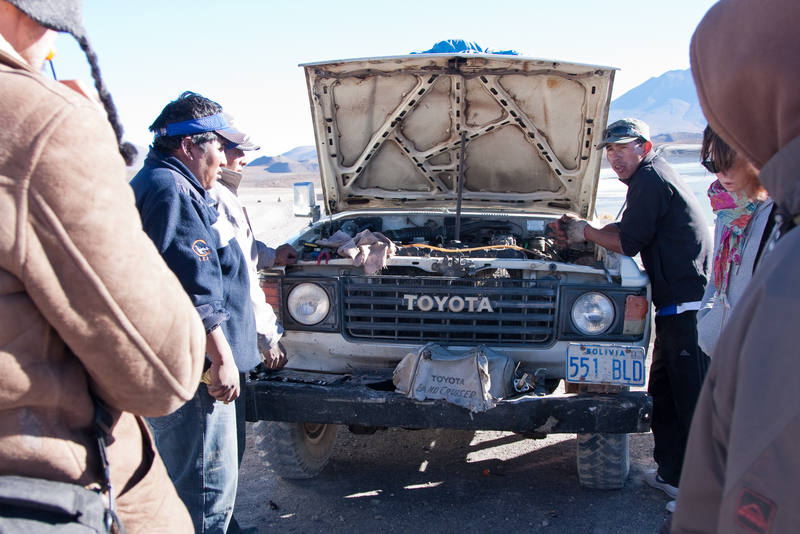 Due to contaminated fuel the fuel pump died stranding us on the second day. Despite having been told otherwise there was no radio to call for help – and mobile phones were definitely out – and it was only because we were on a route that other 4WD vehicles used that we were able to ask a passing driver to let people know we needed help once he arrived back in civilisation. Which he didn’t do. Luckily the accommodation we were staying in that evening were expecting us and when we didn’t show up they contacted the company who had organised our arrival and help was sent overnight to look for us. It was an uncomfortable evening – and we missed out on seeing some spectacular sights due to the delay – but we were rescued because of the accommodation raising the alarm. In Iceland you have other tools at your disposal. The completely free 112 app from safetravel.is and available for iOS, Android and Windows mobile devices allows you to keep in contact by letting the emergency services know your location. It’s simple to use and works by sending a SMS text message so doesn’t need 3G or 4G to operate, hence why I showed the GSM coverage map above – it’s all the app needs to work. Free, easy to use and could possibly save your life. What’s not to like? How you use it is up to you this but I just set my watch to remind me every 30 minutes to check-in. That way if the worst were to happen then the emergency services know my approximate location. So, letting people know is very, very important and Iceland makes it so easy to do that there is no excuse not to do so. It is a zero-cost option for having someone looking out for me. I’d be stupid not to use it. Of course, should I find myself needing assistance I’m likely going to have to wait until help arrives. For my trip I’ve considered three scenarios when travelling by myself: (1) The 4WD breaks down (2) I’m out hiking and the weather unexpectedly turns for the worse and I end up in a biting cold storm with very low visibility or (3) I sprain an ankle. Each of these conditions is quite possible and can be life-threatening if not prepared. The ‘car breaks down’ scenario is a relatively easy one to deal with: Phone the car hire company. However, it may be that they cannot rescue me quickly and so I have to spend the night in the car. That’s where my trusty Alpkit SkyeHigh 600 sleeping back comes in. Rated down to -5°C it means that an evening stuck inside the car out of the wind and rain inside will also be a warm one and a break-down becomes an annoyance rather than dangerous. 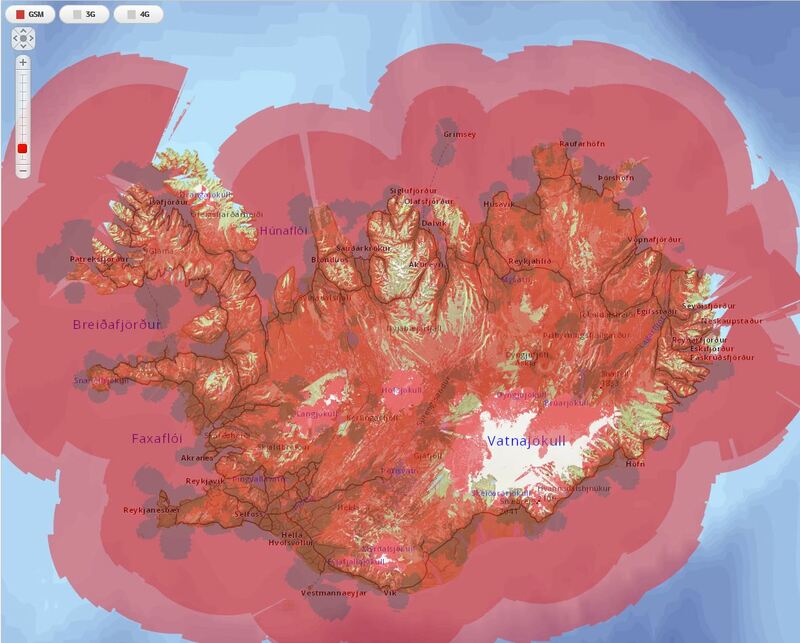 Due to its geography and location the weather in Iceland can change exceptionally quickly, especially in the highlands, and so the best course of action is to assume the worst. For me this entails being out hiking in the highlands of Kerlingarfjoll and a sudden snow or rain storm comes in and reduces visibility to near zero. Cold! The red rectangle shows the highland area that I’ll be hiking in. The first common-sense thing to do is check the weather forecast. 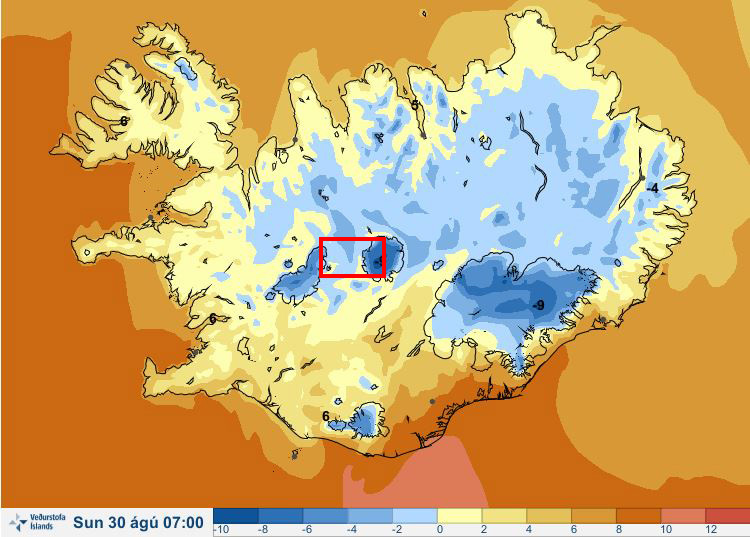 It’s not accuracy that I’m after but rather a general idea and as can be seen in the above image from vedur.is – Iceland’s meteorological office – Kerlingarfjoll is going to be reaching sub-zero temperatures and so I need to ensure that I can keep warm and dry when out-and-about. The easiest way to dress for the occasion is to use the layering principle of clothing (if you’ve not come across this then Google ‘layering principle clothing’). This is a tried-and-tested method of ensuring that your clothing suits your environment and in the highlands the outer waterproof and windproof layer is as important as the warmth-providing base and mid layers. Easy things to forget are gloves and some kind of hat. I am pretty confident in my clothing and I’m happy that it will cope with the extremes of Iceland’s weather that I’ll be facing – it better as 66 North is an Icelandic outdoor brand – but I’m definitely following the advice of many experts who recommend avoiding jeans and cotton as, when wet, they don’t dry quickly and in a cold environment they can accelerate the cooling of your body and speed up the onset of hypothermia. So, should the weather turn nasty, it won’t present an immediate danger and I’ll be warm and dry enough to get back to camp. Assuming I can find camp! GPS used to be the tool of the seasoned outdoor adventurer but smart phones have put this powerful navigational tool into the hands of just about everybody. GPS apps are available for all brands of smart phone and, given that the software is cheap – and you can have a lot of fun later by downloading the data to your PC and showing your friends and family exactly where you hiked on Google Maps – it makes sense to invest in the app. The display may look a little unfriendly but there are also options to download Google Maps data and use if when away from 3G/4G mobile coverage. You can then watch your route unfold as you walk. 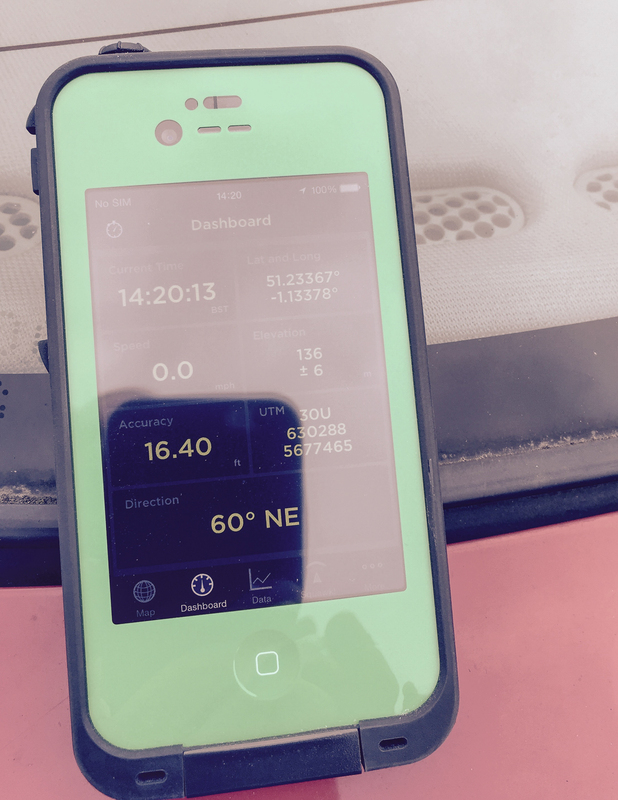 I use an old iPhone 4S with no SIM card and running a dedicated GPS app – in this case GPS Kit. Other than the obvious ability to pinpoint my location it also has a tracking option that will allow me to backtrack without having to rely on visible clues such as path markers should I need to. The phone is in a rugged, waterproof case (by Lifeproof) that I picked up second-hand on eBay so there is no worry about using it in rain or snow. I’ve actually tested the waterproof nature having been diving with it to a depth of 12 metres so it doesn’t matter how bad the rain gets, it won’t be worse than that! I’ve also got a portable USB battery pack that is small enough to be easy to carry but can charge the iPhone twice over. The most likely form of injury when out hiking is a sprained ankle, especially when walking over uneven ground. Anyone who has had a sprained ankle will tell you how painful it can be, but when out-and-about by yourself it can be deadly. 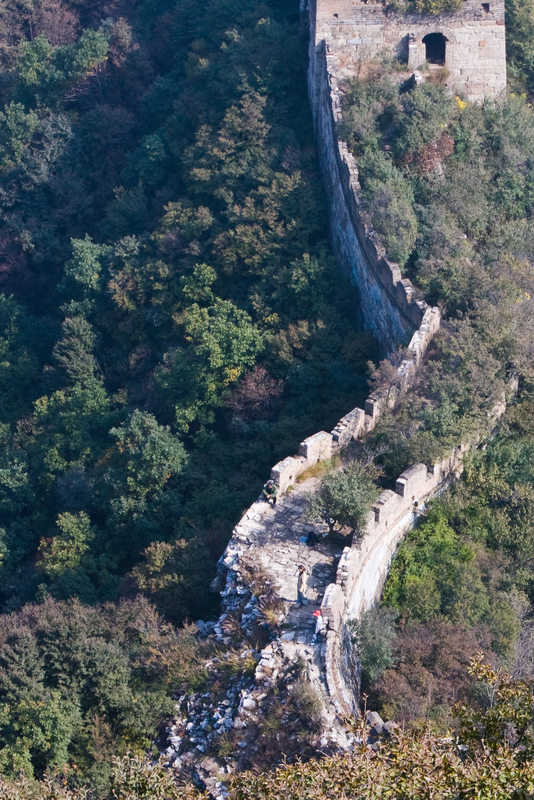 Back in 2008, when I was preparing to walk the wild section of the Great Wall of China, I relied a lot on the local knowledge of a photographer based out there and his advice as simple: Do not walk it alone. People have died after an injury and not being found for a couple of weeks. The good news is that in Iceland’s highlands you wouldn’t have to suffer that long – a night would probably be enough to finish you off. The single best piece of advice I have been given for hiking is to wear properly fitted walking boots that support your ankle. This does not necessarily mean the most expensive walking boots you can find – my current boots were significantly cheaper than all the others I was considering but they hold my feet securely. Looking where you are going and not rushing is good advice too. As my clothing is going to keep me warm and dry, I have no need to rush and anyway, having 10kg of camera gear to carry always slows you down. No, should the weather turn nasty and visibility fail, the only thing that will likely kill me is panic. Each morning tell hotel the route I’m taking, when I expect to be back and that I will check in with reception on my return. I’ll also double-check the weather that day – local knowledge is always good. Use the GPS app to plot my route. Don’t rush and watch where I’m going. Of course, I have my Icelandic “worst-case scenario” kit-bag (which is really just my usual travel kit with a dramatic name) which contains a few, cheap, lightweight items – along with a couple of larger items I use in photography. Despite seeming a large and costly list, the medical bits all fit into sunglasses case so really easy to carry around in a pocket or backpack. At the end of the day you can never plan for every eventuality. What you can do is identify the potential dangers and plan as best you can around them. That’s usually the difference between trips that have “moments” that to tell your friends about for years afterwards and those trips that are your last. As a result of not spending so much time diving on the forthcoming trip to Iceland (see last post for the “why”) I now have an extra day or two spare. But whilst having some slack time in the schedule is always a good thing, I’ve already planned “quiet” days and so don’t really need any more. For some destinations it might be a struggle to fill these extra days, but not so with Iceland – it has the opposite problem: What to leave out. I’ve been driving to a customer site the past couple of days and so had plenty of time to mull the various options over in my mind and I have decided to take my usual “quality over quantity” approach – after all Iceland is notorious for its unpredictable weather and all the images I have planned have specific moods that would easily ruined by the wrong weather. But whilst this approach makes sense to me, others do not seem to share my opinion. I spend a fair bit of time over on the Trip Advisor Iceland forum and not a day goes by without someone asking something along the lines of “Here’s my seven-day itinerary to see the whole of Iceland – what do you think?” I do understand that people have limited time for travel, but seriously, what kind of experience are you going to have rushing around trying to cram everything in? Surely it would be much better to pick a few highlights and explore them a bit more? 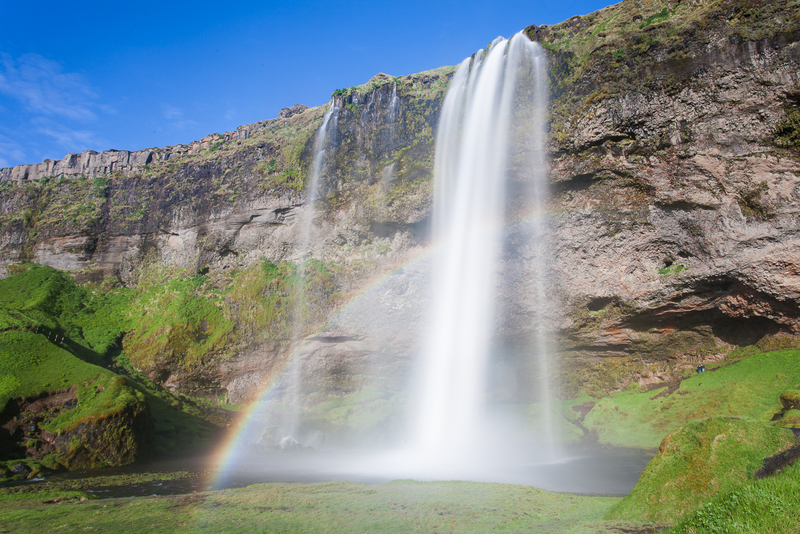 A classic example of this is Seljalandsfoss, one of the most popular tourist destinations in Iceland. Seljalandsfoss sees tourists arrive by the coachload – thousands of them every day during the summer months – and it is easy to understand why. It is an easy day trip from Reykjavik, it is impressively big and easy to approach – you can even walk behind it along a path. The chances are good that you’ll even get to see a rainbow due to the water vapour in the air. So, if you’re looking to see Iceland’s top attractions, you’ll end up here. On my last trip I visited Seljalandsfoss a few times hoping to get an image I was happy with and spent quite a bit of time watching the tourists arrive and depart like waves breaking on the shore. And virtually all of them followed the same pattern: arrive, follow the path to the waterfall, take some pictures, then either return to the car or coach or continue along the path and walk behind the falls and then return to the car or coach. 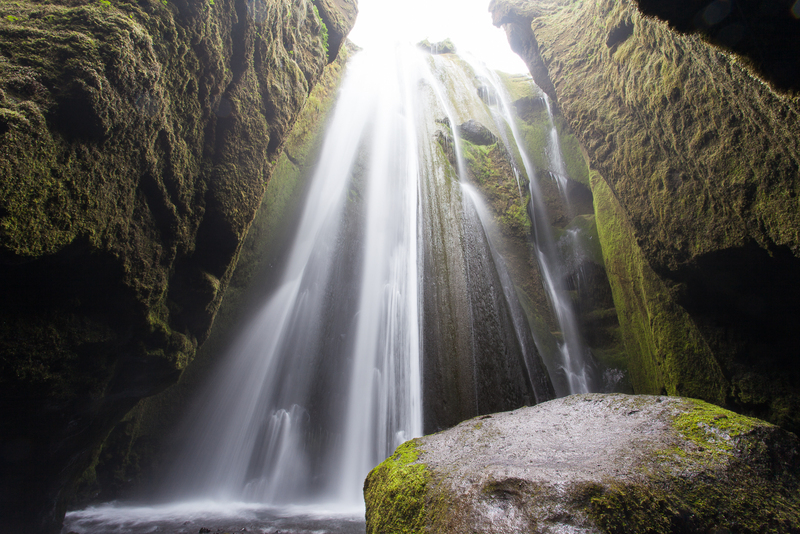 And if you’re on a tight time schedule that’s your total experience of Seljalandsfoss – you’re already off to ‘bag’ the next tourist hotspot. What almost none of them did was take time to look around but had they done so they would have had a bit of a surprise as there are actually two waterfalls. A short walk past Seljalandsfoss is Glufrafoss. 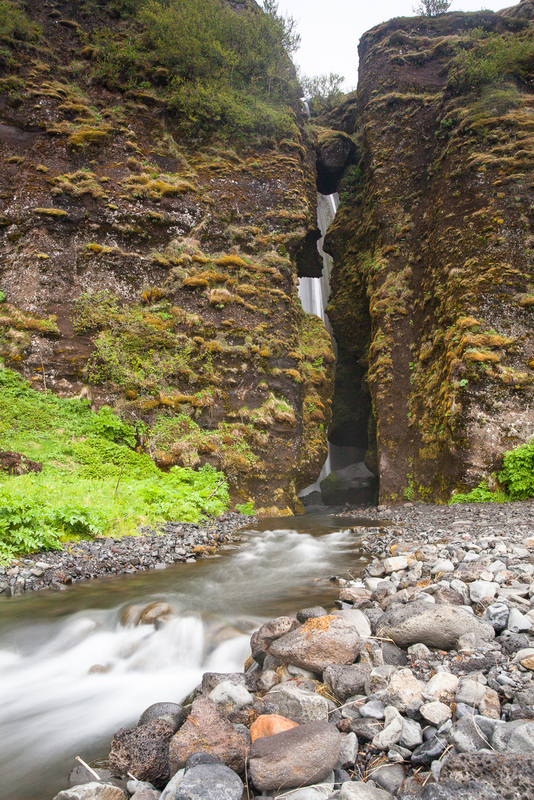 Unlike its more popular brother Glufrafoss is hidden from view – in fact you have to walk through a crevice in the cliff face in the above image. But when you do you have the falls all to yourself as you stand in a 6 metre wide opening with the rock face towering above you on all sides. It’s loud and you can feel the refreshing effects of the ionised air and you’ll probably want to stay a while – luckily there is a handy rock to sit upon. The brave could even stop for a picnic – just bring your waterproofs as it does get wet! I know which experience I prefer. So, that is a very long-winded way of saying that, now that I have more time to explore the Thingvellir region of Iceland, I’m not adding any additional sights to visit and instead am going to concentrate on those already on the itinerary: The geyser Stokkur, Gulfoss and the enigmatic Bruarfoss. 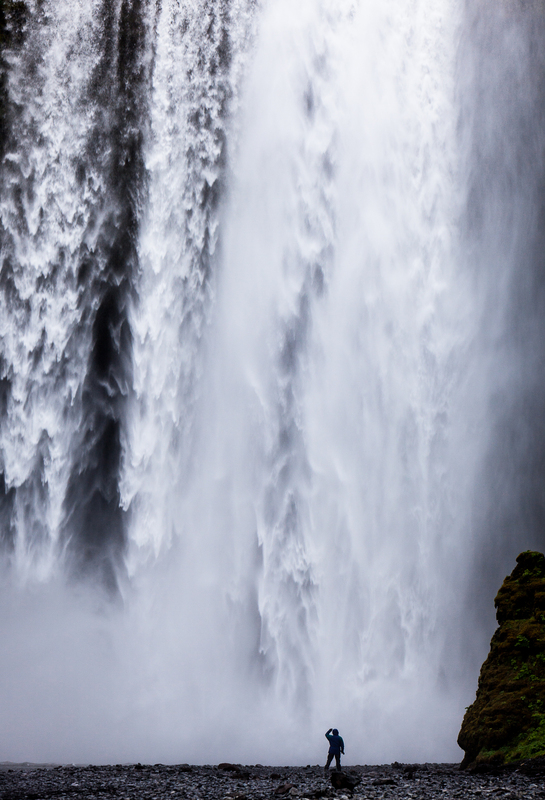 I may revisit Skogafoss as, although it is 100km out of my way, I still feel a photograph is waiting for me there. The Fine Line Between Theory and Practice. The blog has been quiet for a few weeks for a few reasons, work being the primary one. But despite the lack of updates, there have been a few things happening. Probably the most important is that I am now PADI Open Water certified, meaning that I can scuba dive at any PADI dive centre on the planet. PADI is by far the most prolific dive school and so holding a PADI certification certainly opens up options for where I can dive although the basic certification limits me to a depth of 18 metres. Holding the PADI certification is also important for the forthcoming Iceland trip as to dive at Silfra – the only place where you can dive between tectonic plates whilst touching them – you need to hold at least the basic certification. 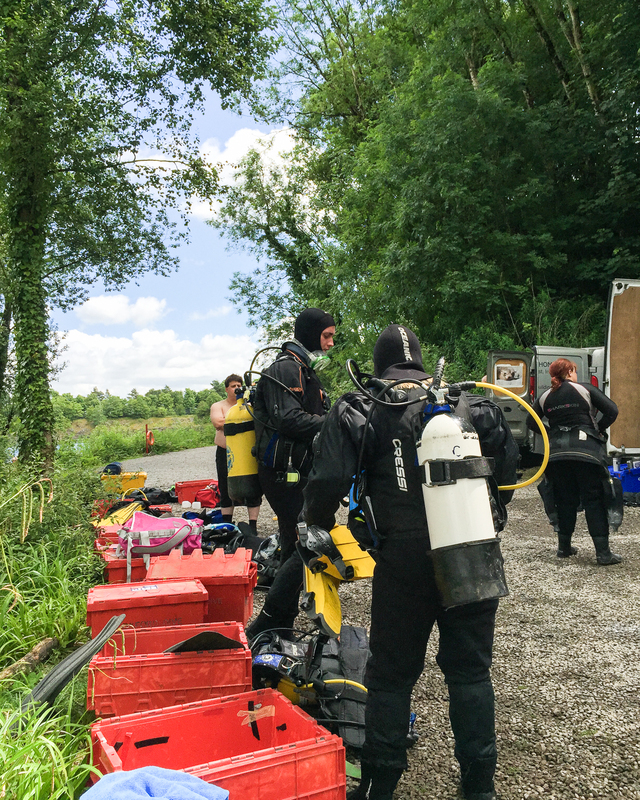 I have also picked up dry suit diving experience – Silfra is a positively cool 2°C and a few minutes of that in a normal wet suit would see you getting first-hand experience of hypothermia. If you recall the “grand plan” was to learn to dive so I could dive at Silfra with the camera. My direction for the web site is extreme environment photography and underwater photography from Silfra would have added some images to my portfolio. In fact the whole trip to Iceland in September was built around this premise; whilst I love Iceland I perhaps would not have returned so soon after last year’s visit. Although I didn’t go in to the details in the last update I had already worked the plan out in my mind: first get the PADI Open Water certification, then gain diving experience throughout July before taking the PADI Advanced Open Water certification and more diving experience with the underwater camera rig throughout August, then Iceland! I knew it was a tight schedule but I think most people who know me would agree that I can be doggedly determined to attain my goals. It was a clear and logical plan. But then I actually went diving. The one thing that I didn’t anticipate in all my planning was just how supremely difficult it is to both move and not move, and if that sound contradictory then bear with me for a while. I’m used to seeing divers on TV programmes and you always see some graceful display of the diver gliding in an arrow-straight line through the water, stopping occasionally to view something of interest before gliding off once again. Uh-huh. What you’re seing there is pure experience and skill. 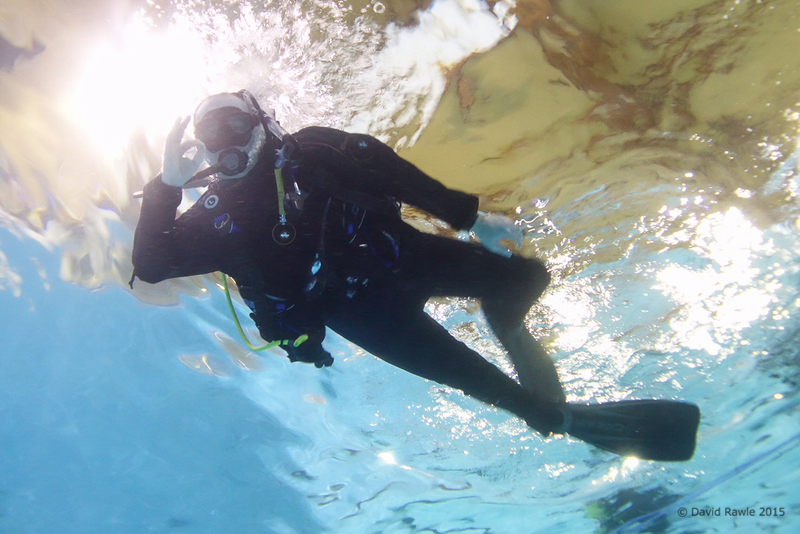 The biggest problem that I – and all new to diving have – is buoyancy. Humans tend to naturally float in water – especially salt water – they’re positively buoyant. But by the time you strap a bunch of kit to them and then add additional weights, they sink like a stone – they’re negatively buoyant. The trick, no the skill is to be neither – to be neutrally buoyant. To attain this neutral buoyancy you have the ability to pump air into your jacket which expands adding buoyancy and, all else being equal, the trick is to put the right amount of air into the jacket to counter the weight of the kit and the additional weights. And pretty much everyone can master this in the first lesson, but two things conspire against you: First as you breathe in and out you become more and less buoyant as your lungs fill and empty and second, as you go deeper or shallower air compresses and expands by a different amount. The result is a horrible combination of factors and what most newcomers assume to be a simple act becomes a frustrating and time-consuming experience. The other issue that I hadn’t accounted for is that currents in the water are continually moving you in various directions. Kneeling on the bottom of the pool or the lake was made more challenging by nearby divers moving and creating pressure waves that buffeted me. Being partially buoyant the pressure waves were enough to cause me to continually have to twist and counter the movement by using my arms. By the end of the course I had become better and I will continue to do so. But, here’s the problem: Unless a miracle occurs I will not be in control and stable enough by September to be able to remain motionless at will – that can take upwards of 50 to 100 dives. 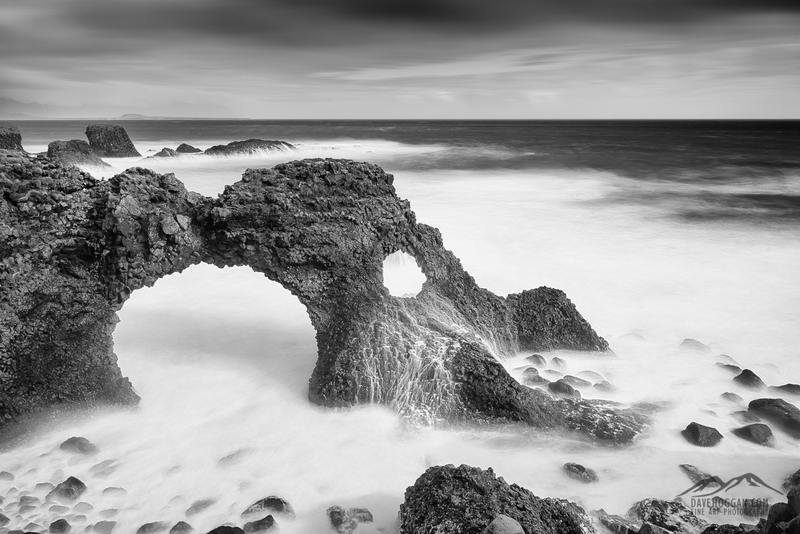 And when photographing landscape – underwater or otherwise – you need a stable platform to shoot from. I’ve been told that I have an air of confidence in this shot. It is not confidence, simply happiness from resignation that I can’t fight Newton’s First Law of Motion. So, at this point I have a choice: Doggedly stick to my plan to spend two days at Silfra and shooting some underwater scenes, or admit I was way too optimistic and call off the shoot. Of course the obvious choice would be to say “Heck, I’ll do it anyway, what have I got to lose?” and, yes, that was my initial reaction, but then the second part of the whole “underwater photography” issue arises: You need a camera that can shoot underwater. It is a topic unto itself but for now suffice it to say all the options I have looked at involve a significant cash investment. Not only that, but I’ll need a lot of time to learn how to shoot underwater. In short, the “do it anyway” approach will have a high cost with a low chance of success. What would be worse: Deciding to pull the underwater photography – the very reason for returning to Iceland so soon – or sticking to the plan, making a huge investment in kit, and ending up with images I am nowhere near happy with? It is a fine line between doggedly sticking to the plan and admitting you were too ambitious and well past your limits. One option smacks of failure whilst the other of stupidity. But anyway, after a lot of agonising, I have made a decision: I am going to postpone the underwater photography. Yes, part of me feels like I’ve failed and yes, part of me is disappointed. But if I am to aim to do something I might as well aim to do it right. I can still dive at Silfra – a kind of recognisance mission – but I can concentrate on the dive and not the photography and probably have a far more enjoyable time in the process. Plus I have more time to explorer the surface of Iceland. Well, as enjoyable as swimming through 2°C water allows.